Here is the latest reading on capacity utilization. Data for August 2013 released yesterday. It has been flat-lining for over a year and a half. Look familiar? Similar thing was happening before the crisis. Note: To really appreciate capacity utilization, here is a table giving the sectors of industrial output involved and their value-added weights. Capacity utilization covers 3 stages of processing goods; Crude, Semi-finished and finished. Industrial sectors include food, oil & gas extraction, chemicals, petroleum & coal products, transportation equipment, computer & electronic products, pharmaceuticals & medicines, plastics & rubber products and electric power generation. I have heard it said that industrial production only accounts for around 16% of the economy and thus does not carry much weight. Remember that imports are also around 16% compared to real GDP. But beyond that, there are a lot of industries adding value onto industrial production, which include advertising, sales, marketing, distribution, packaging, healthcare, infrastructure projects and even construction. The demand that these industries encounter for their products and services determines capacity utilization in industrial production. Capacity utilization is a powerful indicator for the utilization of resources for the whole supply chain from raw materials through processing to the final consumer. So anyone who discards capacity utilization is not seeing its importance as an indicator of resource utilization throughout the supply chain. 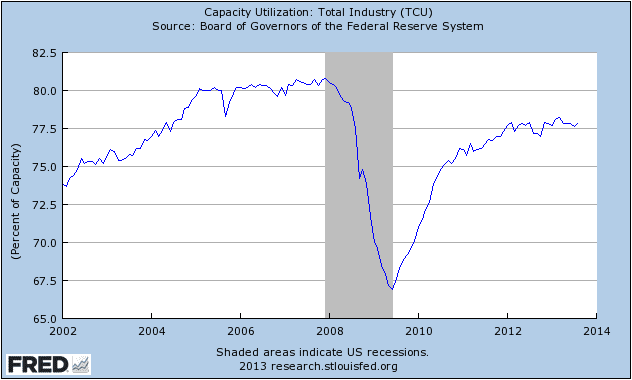 Still, it is not a good sign to see capacity utilization stalling out around 78%. Effective demand is tighter than ever before… and constraining both capital and labor utilization. The data is only available on an annual basis and only goes back to 1947. It’s still not available on FRED. Industrial production was 14.3% of NI in 2013Q1. This data is available at a quarterly frequency and goes back to 1948. It can be found both at the BEA and FRED.